One of the first things that a person notices about a flyer, brochure or sell sheet is the design. The right design can make any message more memorable. Not every person has the ability to use powerful software to create beautiful designs or graphics. Our Santa Monica copy shop employs experienced graphic designers that can design or double check a submitted file or document for accuracy. These pros know how produce industry standard graphics. Excellent designs of graphics and photos would not be complete without commercial printers that are used to complete the process. The average home or office printer is not capable of industry standard printing. Our Santa Monica copy shop invests in the highest resolution technology available to produce our printed materials for our customers. Our selections of paper products help to create visually appealing prints ready for distribution, promotion or marketing. Choosing a professional print shop may be confusing without the right information. Questions before a printing job is ordered are a normal part of the process. Our copy shop in Santa Monica answers preorder questions with accuracy and can help any customer choose the right style, design and product for any use. Customer service is an important part of the printing process and all of our customers are treated fairly and professionally with an initial consultation to the completion of the printing process. 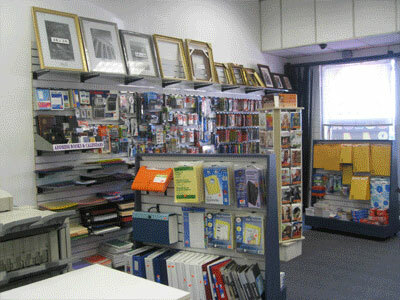 Our copy shop Santa Monica center provides easy photos for passports, postcards, full color printing, black and white printing, graphic designs, posters, copying and book binding, full color signs, custom banners, legal forms and office supplies, brochures, postcards, posters, magnetic calendars, letterheads and envelopes, mousepads, calendars, mounting and laminating, large size copies, photos to posters, custom t-shirts, roll-up banners, promotional products, business cards and presentation folders. These products are perfect for business or personal use. The modern printing machines that are used in the commercial industry today are unlike the manual machines that were used in the past. The large and bulky machines were replaced with automatic machines capable of high-resolution digital printing. Our Santa Monica printing shop has the needed experience and machinery to produce any copy or print job accurately and quickly. Our reputation was built on meeting deadlines and exceeding customer satisfaction with each printing job. Logos, graphics and photos have replaced the textual printing that is common with home and office printers. The industry standards have changed and more individuals and companies are using full color printing as part of a marketing, advertising or distribution campaign. Our Santa Monica printing shopsimplifies the color printing process and keeps the price affordable for any budget. Our high-resolution digital printing capability is available for all customers to incorporate into any printing job. Graphics can now be printed on various items. These items are no longer restricted to include t-shirts, hats, business cards or stationary. Modern promotional products that are used for personal or business use are common in every industry. These items can now include high-resolution graphics and colors. Our printing shop in Santa Monica prints many different promotional items that are designed to get attention and deliver an important message or announcement to the world. Getting your questions answered before printing begins is important to your printing project. Our ordering process can be completed easy. Our customers enjoy the ability to order at our website, by telephone or directly at our printing shop Santa Monica center. Our team checks each submitted order for accuracy before printing production begins. You have the ability to pick up your order or have it safely shipped to your business or residence to meet your deadline. Residents of Santa Monica, CA in zip codes 90401, 90402, 90403, 90404, 90405, 90406, 90407, 90408, 90409, 90410, 90411 can contact us at (818) 775-0255.